How many pounds do you need to lose in order to reduce your waistline by one inch? How many kilos do you need to lose to reduce your waistline by one centimeter? We wanted to find out. 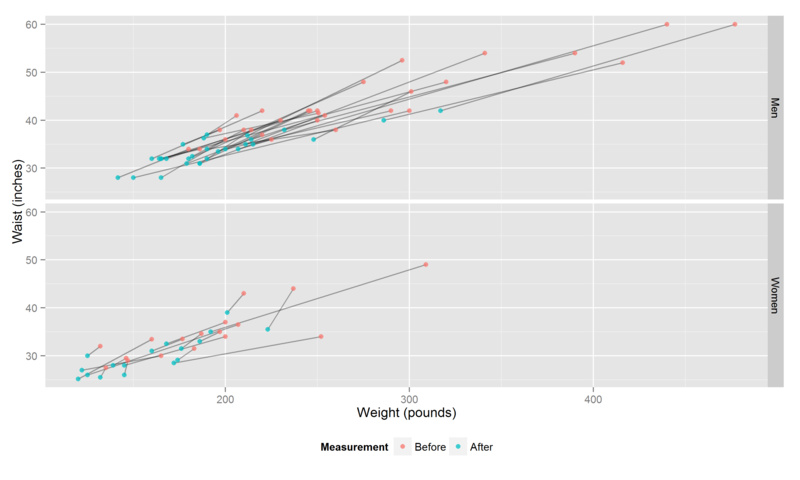 We were having trouble finding published data (though we are expecting some soon), so we turned to Reddit, where the progresspics subreddit contains people’s before-and-after weight change stories. Most posts contain only pictures, but if you do some web scraping, you can find cases in which people post their before-and-after waist measurements. We found 46 such cases, typed them up, ran them through R, tidyr, dplyr, and ggplot and made the picture above. The picture is a bit rosier if you are losing under 55 pounds (25kg): You only have to lose 6.1 pounds to lose an inch (or 1.1 kg to lose a centimeter). Want to make this graph yourself? OK.
Why am I doing this? Hal are following up our face morphing stuff with body morphing stuff. Eight pounds = one inch is exactly the case with me. Hi, nice regression study! Thanks for sharing. Been trying to figure out this myself, but there will be a few of different factors that will change the number (mainly height and current weight). 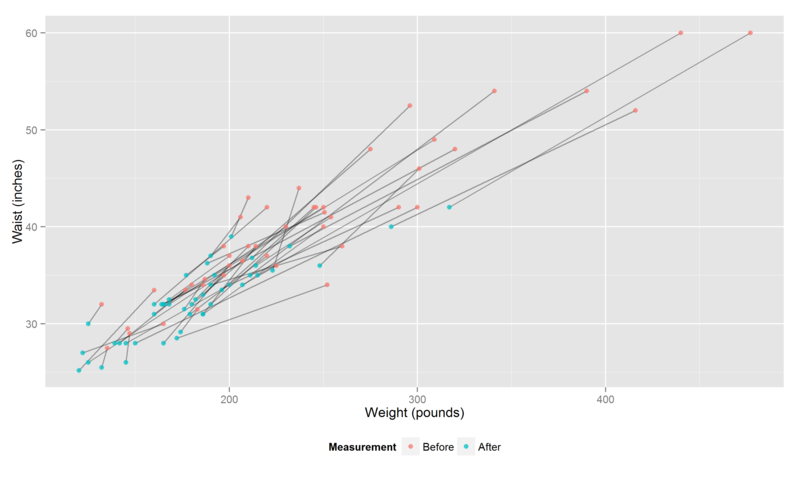 I used the numbers of my own weight gain through the years and figured out that the relationship is not linear/constant, and the higher is your current weight, higher is the number of pounds to reduce your waist size. But if your waist went from 32 inches to 38 inches then you may not have gained 60 extra pounds. Could be 150 pounds to 180 pounds so 30 pounds divided by 6 inches in this case = 5 pounds per inch. This seems way off to me. I’m 5’7″ 175lbs with about 24% body fat and a 38.5 inch waist. I’m currently training to drop my body fat down to about 12%, target weight about 158lbs (this doesn’t include inevitable muscle gains), and a 32-33 inch waist. This translates out to 2.6-3.0lbs of fat loss per inch of waist line. I’ve already dropped about 1.25 inches in 1.5 weeks while dropping less than 2lbs. I’ve obviously picked up some muscle from my HIIT cardio activities. Anyway, maybe it’s because I’m shorter at 5’7″, but 8-5-10lbs per inch isn’t even close by my approximation. I’m not sure where you are getting 10 lbs / inch from but the end of the post says that people like you who are losing under 55 pounds need to lose 6.1 pounds for a one inch reduction in waist. All I did was plugged in your current BMI of 27.4 and your target BMI of 24.7. It predicted that if you lose 17 pounds, your waist will drop 2.7 inches. This is 6.2 pounds per inch. My estimate was 6.1 pounds per inch. I looked at a handful of papers in the academic literature, and they found that a 1 KG loss is associated with about .9cm waist circumference. This is also about 6.2 pounds per inch. What size will you be after you lose weight? was written on November 14, 2014 and filed in Ideas,R,Research News.